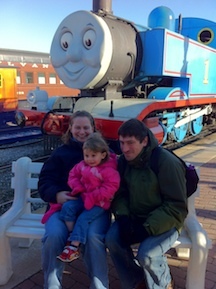 This weekend, we took Daughter Person to the Strasburg Railroad for a Day Out With Thomas. We stayed in Lancaster, PA at a Homewood Suites – which worked out well for us. We could put Daughter Person to bed in the “bedroom”, yet Dad and I could stay up in the “living room” until we were ready to go to bed. What didn’t work out so well was her sleeping in her own little cot – she preferred to be in the “big” bed – which was at least a king size bed, so Dad and I had some room to ourselves. Daughter Person had a blast – and even I thought it was fun seeing all of the old steam trains. In addition to riding on “Thomas” (yes, the engine in the picture is the actual engine pulling the train), we also rode on the “normal” steam train to Paradise, PA. It was really interesting to see how slow the train was, it felt about 15-20 mph, and we even saw an Amish buggy going faster than the train at one point. I don’t know if that’s the top speed of the train, or if they go that slow to make the trip a 45 minute trip. The tickets themselves weren’t horribly priced (~$92 for the combo ticket), but the “extras” were, lunch was $25 for the three of us – and it was sandwiches and hotdogs and fries. And we “had” to get the formal picture which turned out a lot better than our cell phone pictures, which was $17 with taxes. All in all, we spent about $500 for the weekend – tickets, hotel, gas, etc – all budgeted! I think it was $500 well spent to see Daughter Person’s face as she got to see “Thomas”. This entry was posted in Finances, Travel on November 25, 2013 by Mom. I can’t quite put my finger on it, but this greatly amuses me. I wonder what the buggy occupants were thinking? Perhaps they didn’t care. I noticed your comment on cashreb today about computers being able to program themselves. This also amuses me because as a fellow programmer, I’ve been hearing the same thing for as long as I can remember. Not gonna happen; not anytime soon at least. The steam train is a fairly permanent installation and they run it almost every weekend for tourists and for cargo transfer at other times, so my guess is that the local Amish are used to it. I’m just curious as to why the train runs so slowly – I was under the impression that steam trains were faster than horses.